The management of acute pain after surgery decreases the risk of complications, facilitates early mobilisation and decreases hospital length of stay. Our pre-admission clinic ensures all assessments have been completed before your surgery and ADU provides services for day surgery and admissions for overnight stays. Our paediatric unit uses a holistic approach and always makes the needs of your family the focus of your child’s care. 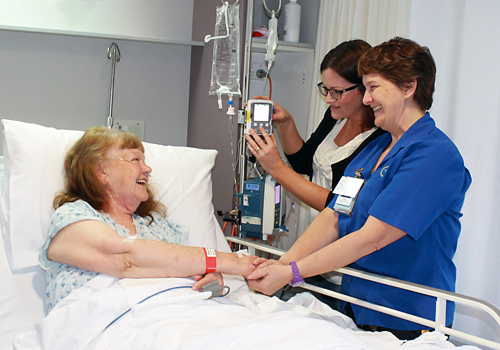 Our critical care unit provides highly specialised clinical care. The ED is always open and is staffed by a dedicated team of health professionals specialising in emergency medicine and critical care. The HITH program offers you care in your own home or another suitable place so that you can leave the hospital sooner. Our maternity ward provides a supportive environment for new mums with 24-hour care from our team of midwives. Visit our section on Having a baby? Our medical ward is located on the ground floor. When you are admitted an individual care plan will be coordinated by our team of medical professionals. The renal dialysis unit a can treat up to 21 people and is serviced by two specialist kidney doctors (nephrologists). The surgical ward provides post-operative care and consists of 25 beds with a mixture of single, double and four-bed rooms. We offer a range of surgical procedures with different levels of complexity in our theatre complex which consists of 4 well-resourced operating theatres. THRC provides rehabilitation and geriatric evaluations and supports people who have disabilities to achieve their independence. Our aim is to provide therapy suitable for your needs so that you can return home as soon as possible. Our staff maintain our standards of excellence with continuous education and professional development. This ensures all our staff are up to date with current advances in medicine and treatments.